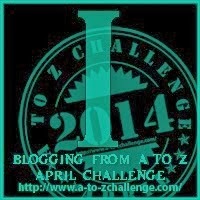 An inquest is a legal enquiry held to establish the cause of death of a person. In Victoria the files of inquests held between 1840 and 1985 are at the Public Records office of Victoria. 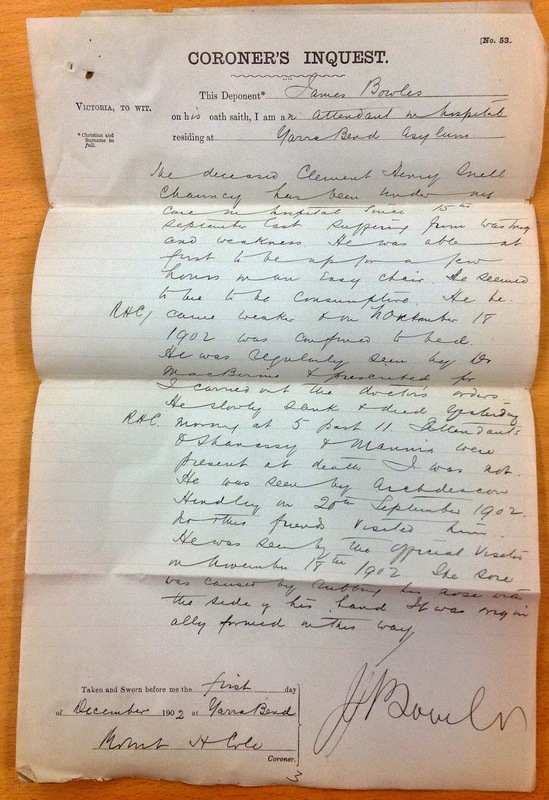 An example of an inquest for somebody who died in an asylum is of Clement Henry Snell Chauncy (1865-1902), my great great uncle, the son of Philip Chauncy and Susan née Mitchell. 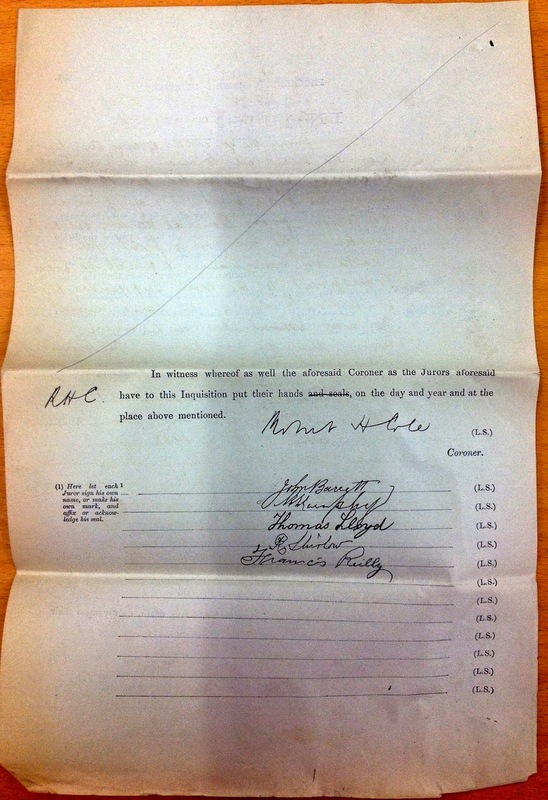 I attach images of the inquest file below to show the sort of information that can be gained from looking at the inquest of a deceased asylum patient. 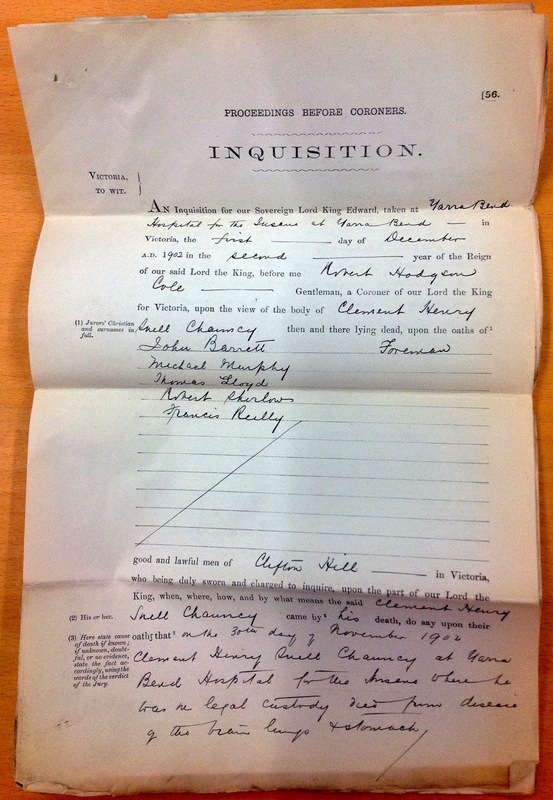 The inquest was held on 1 December 1902. A coroner and a jury with foreman and four others reviewed statements from medical staff at the asylum. 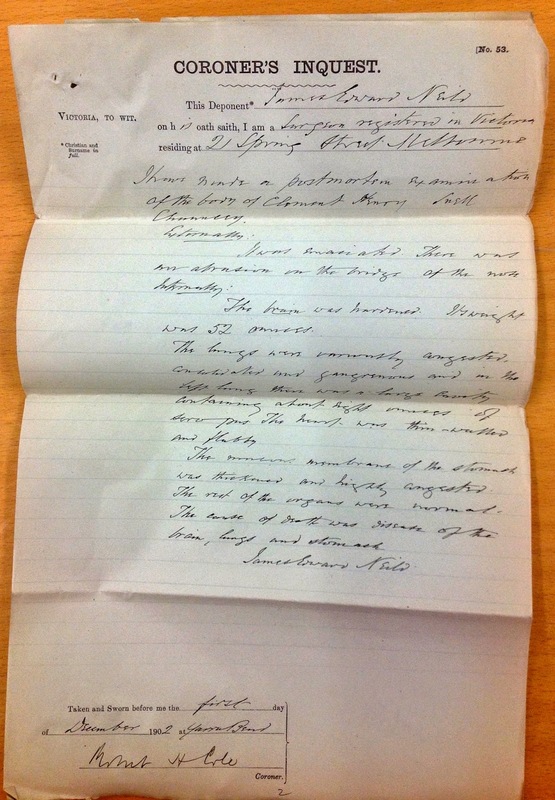 They found that Clement died on 30 November 1902 at Yarra Bend Hospital for the Insane, where he was in legal custody, of disease of the brain, lungs and stomach. 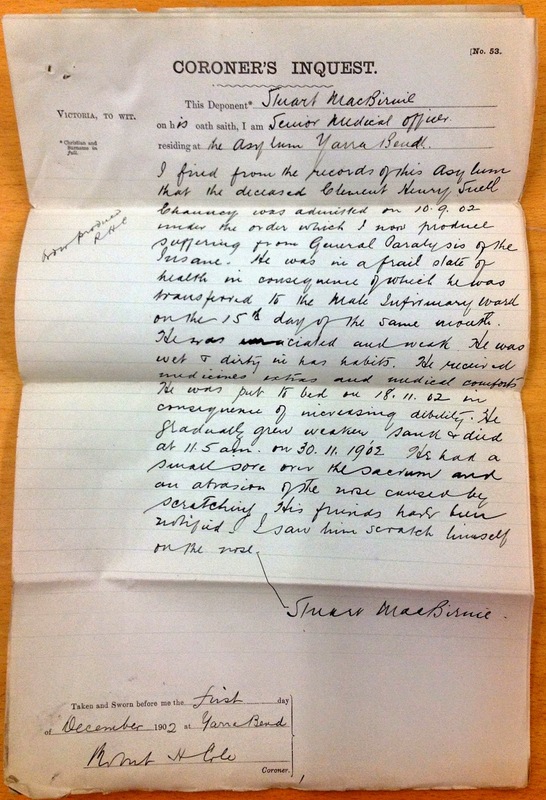 Clement had been admitted by an order to Yarra Bend on 10 September 1902 suffering from “General Paralysis of the Insane”. He had been in the hospital since 15 September suffering from wasting and weakness. 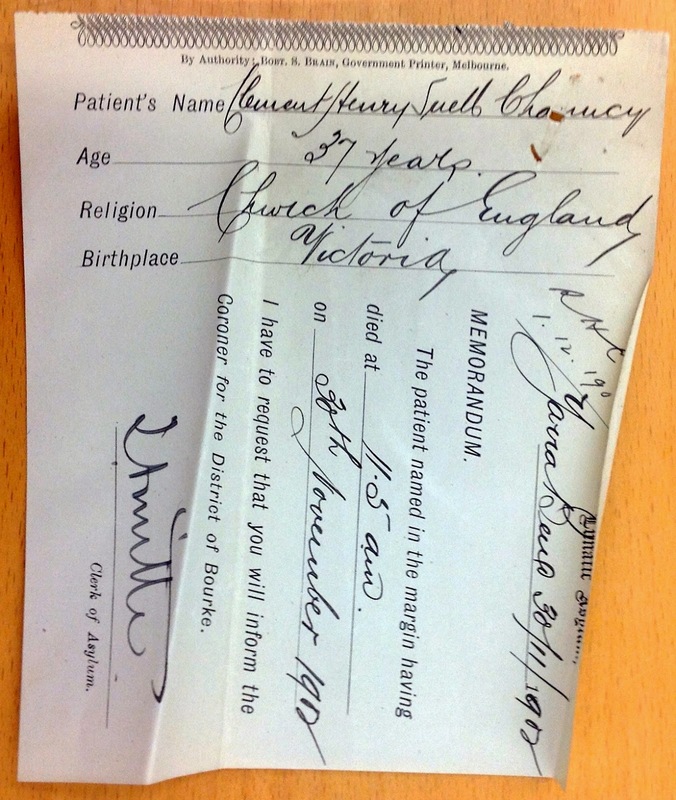 Clement had been visited by Archdeacon Hindley on 20 September 1902. He also had friends visit him. The official visitor, appointed by the government, saw him on November 18 1902. A post mortem examination determined the cause of death which was accepted by the coroner and jury. The inquest does not mention that Clement was survived by a wife and son. He was only 37 years old.